Elementary my dear Watson, there is crime afoot. Not a crime in the fractional sense, but it wouldn't certainly be a crime within itself for players not to experience Holmes and the Stolen Stones for themselves. 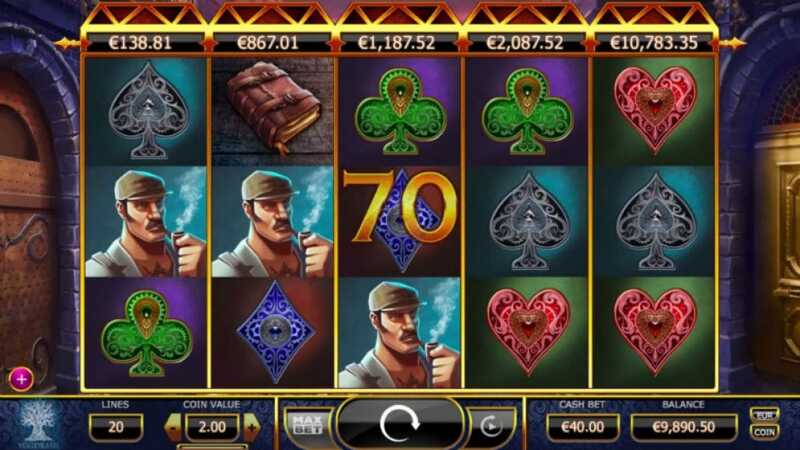 Holmes is known to be quite wealthy, players will find out just how wealthy when they run these reels. Your purpose in this slot is to help Holmes and Watson discover a mysterious case of some missing diamonds, diamonds so precious that they permeate through the screen. These expensive stones have a very high price tag, this is probably why the thief took them in the first place. But what they didn’t understand was that they’d have the world’s greatest detective and his new sidekick: you the player, on his tail. Don’t think that the cash prizes here are from the diamonds you’ve managed to find, no no. The prizes here are probably from Holmes own pocket, so don’t you dare think about taking those diamonds for yourself! If you do you might end up being the antagonist in the next Holmes game, and although that sounds alluring we wouldn’t advise it, simply based on the track record of the man chasing you. This title features a lot of things to see and do so try not to get too distracted. Expect bonus games such as free spins and progressive jackpots among others. In this slot you will find many twists and turns, with both being literal when you spin the reels themselves. The Arthur Conan Doyle creation has been adapted many different times over many different generations. This is a premise/theme that has stood the test of time. So what can you expect here? Quite a lot actually thanks for asking. Bets can be set from as little as 0.2 coins, allowing players of different currency based backgrounds to create their own path moving forward. Prizes are won on the reels with successful matches of certain symbols, each symbol will have a different numerical based value — with the more you match equalling the higher you will initially receive. All the symbols on the reels will be something in relation to Holmes himself and the lore of Holmes overall. Expect magnifying glasses and things of the like to appear here. The highest paying symbol will grab you 4,000 coins, the symbol for this prize happens to be the thief of the diamond himself so be sure to keep an eye out for that one. Discovering 3 of the keyhole symbols will trigger the bonus round, in where players will need to find bags of coins and match them in repeat succession. This bonus round will end whenever one of the crates matched possess a cloud of smoke, thus signalling an end to an otherwise fun experience. Whenever players trigger this mode they will also collect a bonus of 10,000 coins which acts as the perfect incentive for players to continue making strides with the different features on display here. Matching the free spin keyhole symbols has the possibility at triggering a bonus score. 10 free spins will be awarded, and players will find themselves scoring even higher in this mode. If you want to be winning the big bucks, then you’ll need the free games to achieve your desires. Based in Malta, Yggdrasil is an online game dev company that was founded in 2013 by Fredrik Elmqvist. That name rings a bell? If not then you might need to question why you don't know this person. Fredrik is the former NetEnt CEO which is a massive name in the online slot industry. Now lending his talents in a new environment, Frederick's vision to create new forms of entertainment has seemingly transcended into this new endeavour where the focus is still on player satisfaction with just a pinch of imagination in theme and gameplay: something he is notoriously known for. Ask any other developer and they will tell you that sparks of creativity cannot be just handed out, instead, they are earned through trial and error/years of harnessing a craft. Yggdrasil has only a few years under its belt, but it has managed to become more than a squiggle in a sea of quotients, it has become its own beast and one that will continue to wreak victorious havoc on the online game industry for many years to come. Believe us on that. The stakes will forever be at a high with this slot. Mysteries often leave us in suspense as an audience, but never have players been able to take solace in the fact that you are helping the world’s greatest detective solve a rather fun mystery. Pay-lines are set at 20 with stakes being completely up to the player in how they wish to proceed. There are lots and lots of things to see and do here, so you may want to dress up as Holmes himself to give yourself an advantage in looking for specific spins on the reels. Remember that the bonus rounds and certain symbols will take you to the upper echelons of high scoring players, so keep your wits about you, stay strong and you will succeed.